What to drink when you're "not drinking"? Mix up refreshing mocktails with more than 80 unique, delicious non-alcoholic drink options for everyday and any occasion. Michelin-starred celebrity chef Vikas Khanna has created a dazzling collection of non-alcoholic drink recipes, from herbal infusions to new combinations of teas, from tantalizing elixirs, smoothies, and slushies to the trendy shrubs”or drinking vinegars”now taking over the taste buds of foodies worldwide. Mocktails, Punches, and Shrubs includes step-by-step instructions for drinks that showcase innovative blends of not-so-common fruits, vegetables, sauces, and syrups to concoct interesting, healthy drinks. Tips and variations allow you to play with your imagination and create custom concoctions suited to your individual palate. 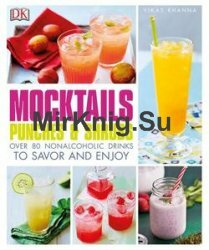 Mocktails, Punches, and Shrubs is a beautiful recipe book for conscientious hosts, those who abstain from alcohol for pregnancy or health and wellness, or who just love a refreshing, unique, delicious beverage sure to lift the spirits.